It’s been a while since I blogged about my etsy shop; so here you go! 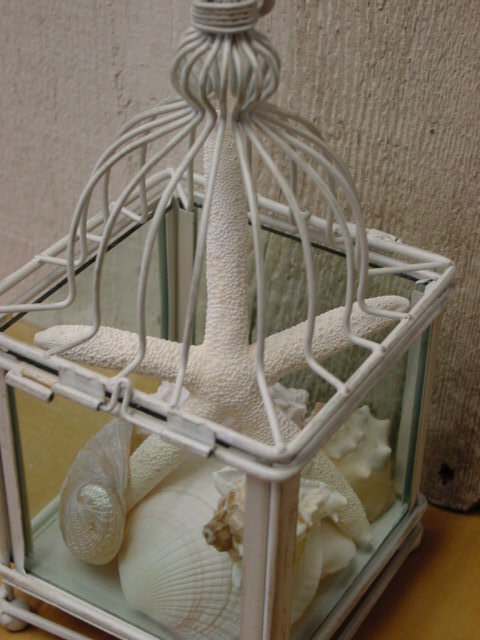 A post about the great beach cottage decor items in my blog. LOTS of Framed white fingerling starfish. Great hung alone, or in a group. 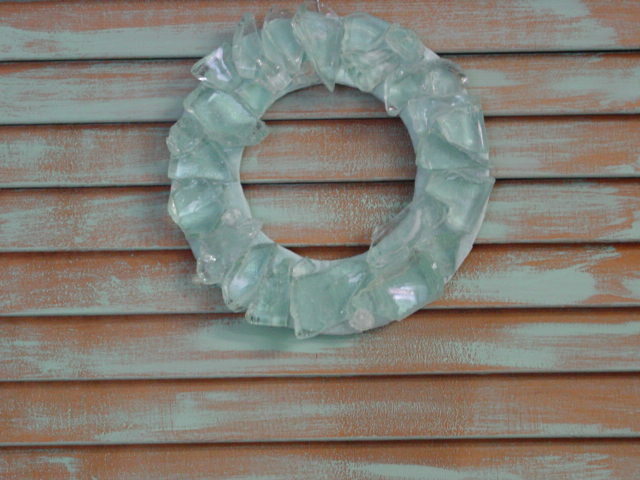 OR hang a sea glass wreath with a couple of framed starfish. 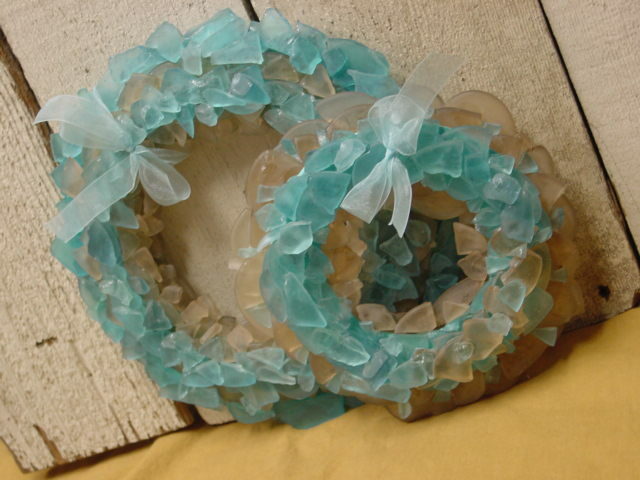 This is the very LAST of the sea glass wreaths that I will EVER be making. 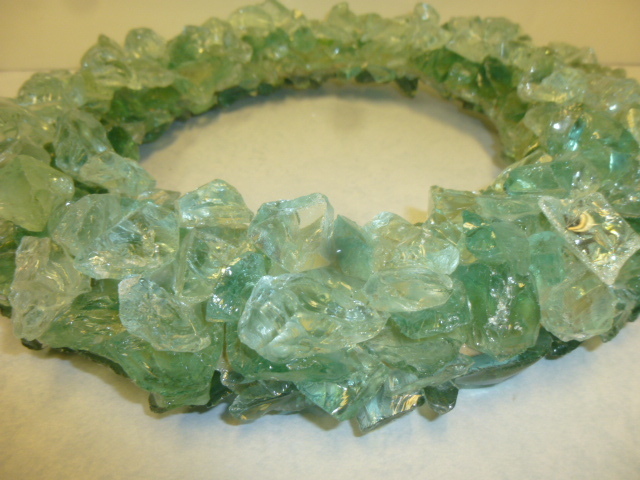 I had stumbled upon a ‘once in a lifetime’ AMAZING buy on the glass to make these; and I’ve finally used it all up. 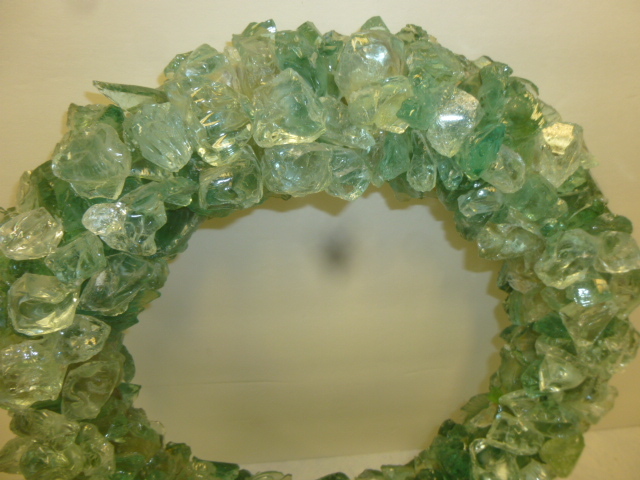 For as ‘simple’ as they appear to be; they are EXTREMELY time consuming to make also. There is NO way I could actually charge for the amount of time I put into them. Lesson learned. Even though they were so labor intensive that they can’t be make ‘profitably’; they really are beautiful in person. 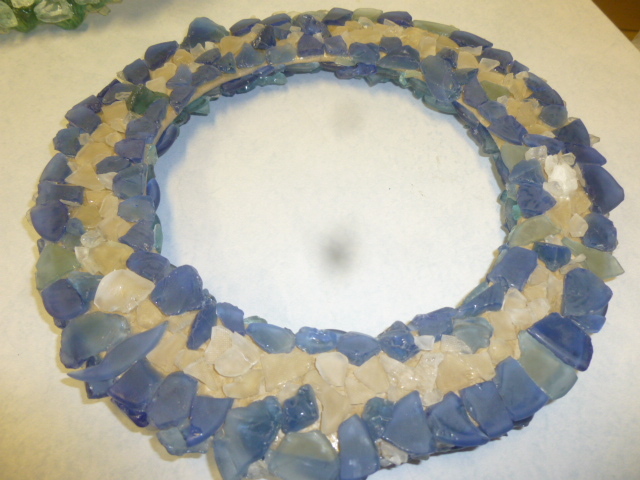 When I first got the sea glass and was sorting through it, I had set aside a few ‘extra pretty’ pieces. Some uniquely shaped; perfectly round or square or like gumdrops. 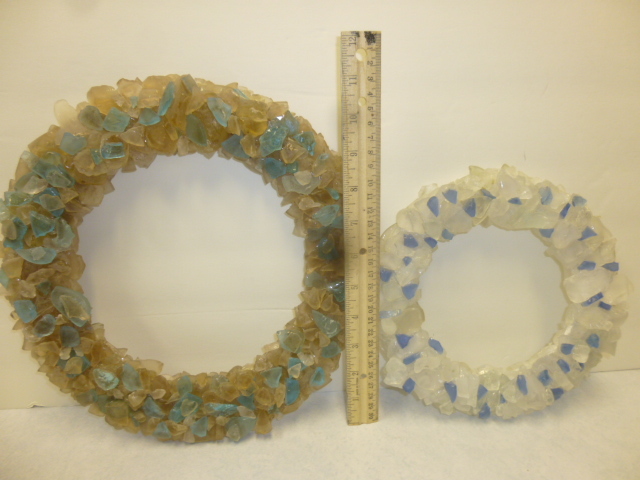 they were just too special to mix in with all the other pieces on the wreaths. 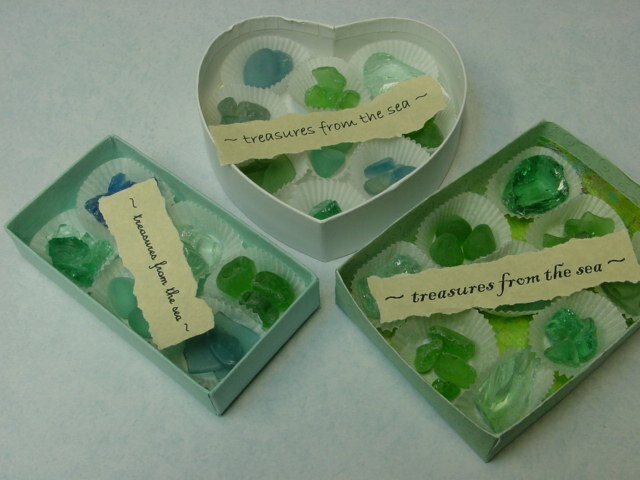 So, I put together some little ‘treasure’ boxes for them. I custom blended this glitter for these mermaid crowns. And of course, beach cottage SIGNS in my etsy shop! 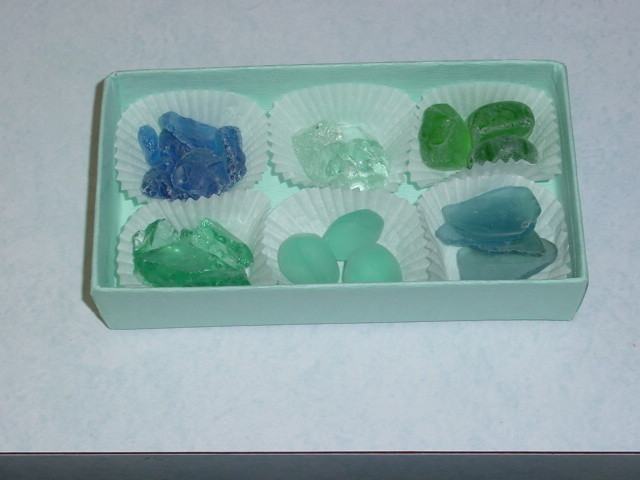 One of my recent conquests was the two drawers full of sea glass I had. The beauty of the shimmer of the glass is completely lost in these pictures. It’s gorgeous in person. 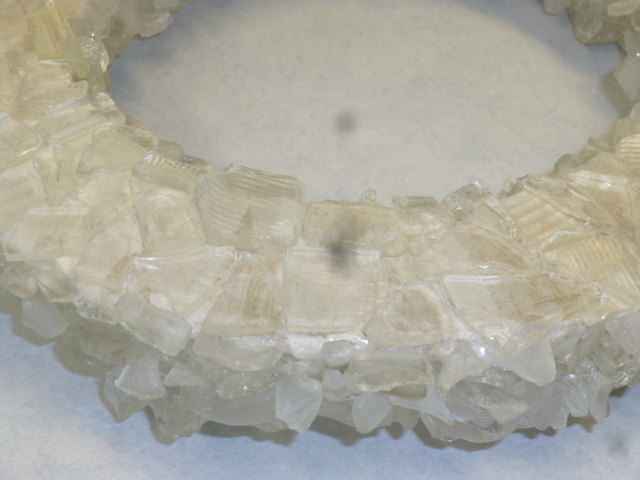 You can see a bit of the shimmer in this side view photo. Yep, almost two inches thick! 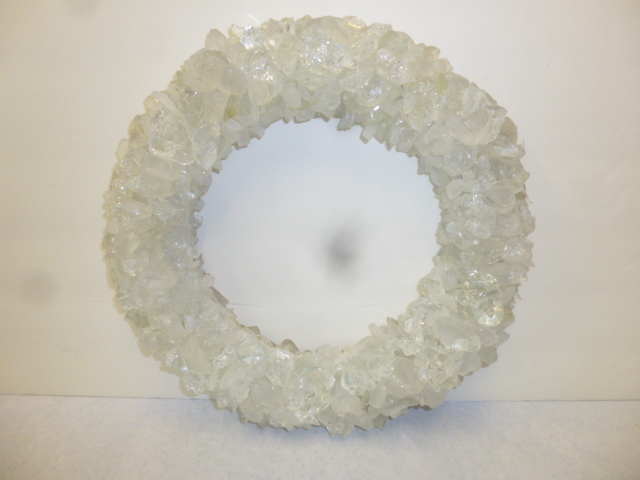 And while it’s not really ‘necessary’ to add a layer of glass on the back side of the wreaths (because it won’t really show once it’s hung) I decided to do so just to use up as much glass as I could! There’s a little more of the shimmer! I didn’t think I’d like all white, but it really is my favorite of the bunch! 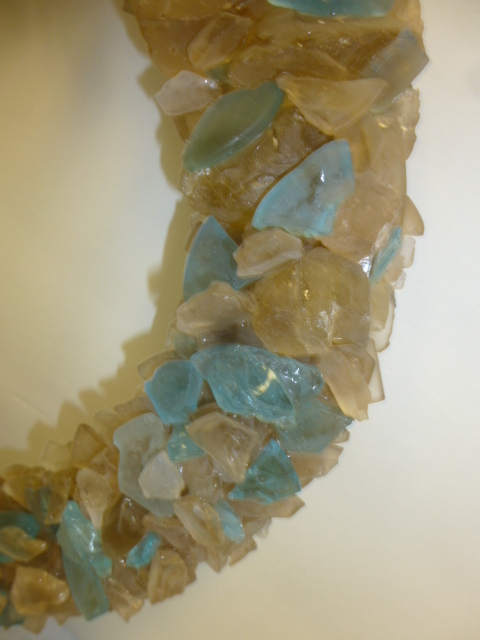 Large tan and aqua, and small white and blue. (now I wish I hadn’t added the blue to this white one! But I made it before the bigger all white one and realized how much I liked it! This one has several layers also. 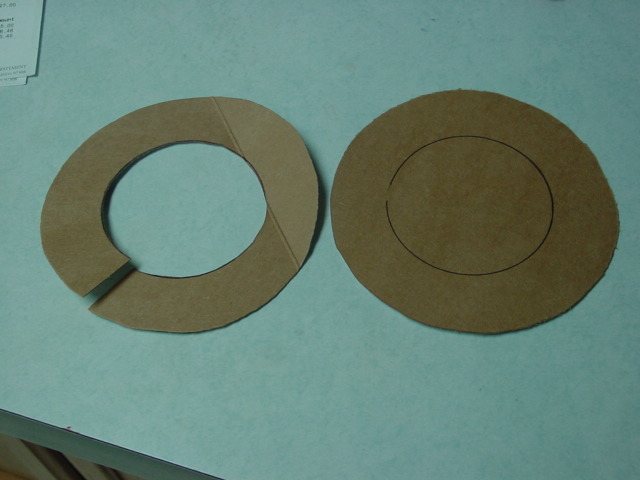 I started with tow cardboard circles glued together. 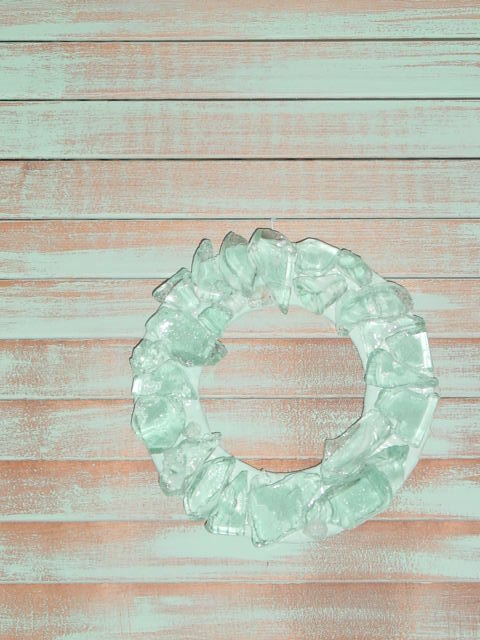 (tacky glue for ALL the gluing on these) Then I covered the cardboard with some paper to match the color of the wreath. 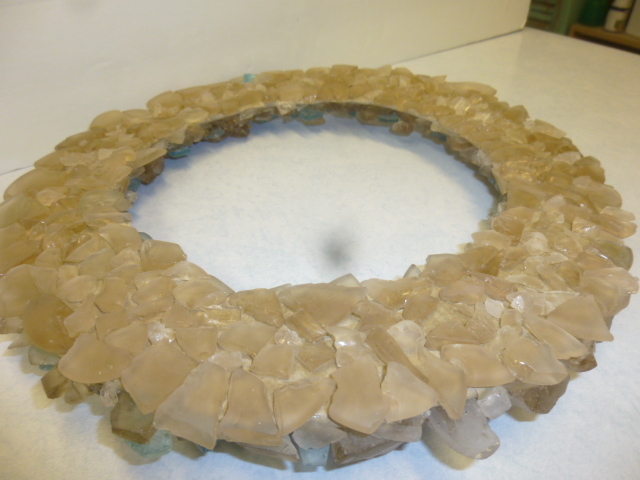 Once that was dry, I started adding the glass pieces. a layer at a time. The DRYING is what takes the most time on these. My secret speed drying method is to put them in the oven! First turn the oven on to the LOWEST setting. 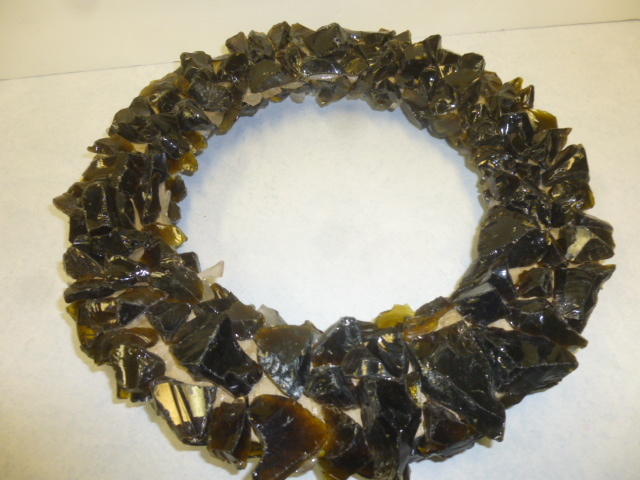 Once it reaches temp (and the light goes off) TURN IT OFF, and put your wreath in directly on a rack. 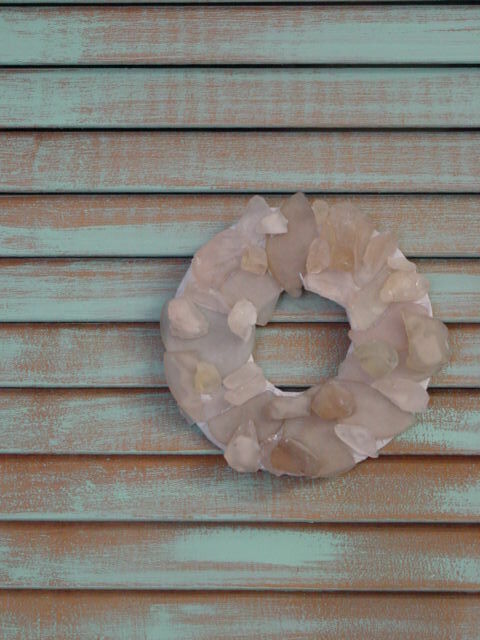 I was working on several of these at a time, so I heated the oven up each time I added another wreath. Be VERY CAREFUL to not leave the oven ON! 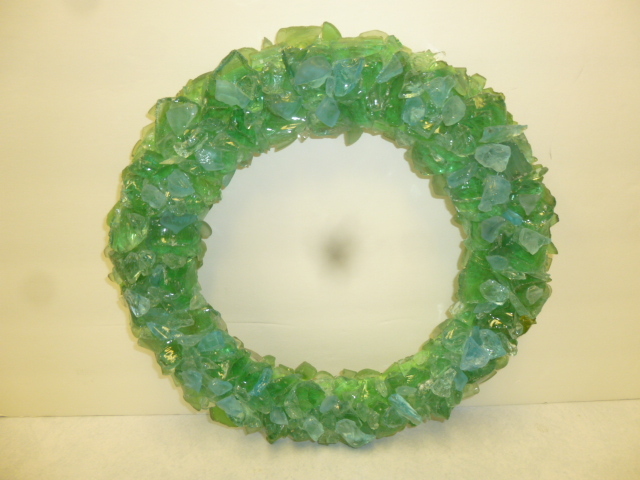 Backside of the tan and aqua wreath. 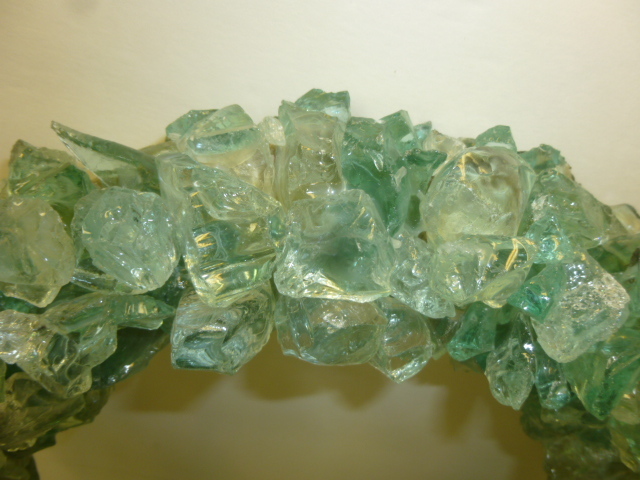 Again, LOTS of layers of glass; all glued on with tacky glue. I used green paper to cover the cardboard on this one. BLUE!! 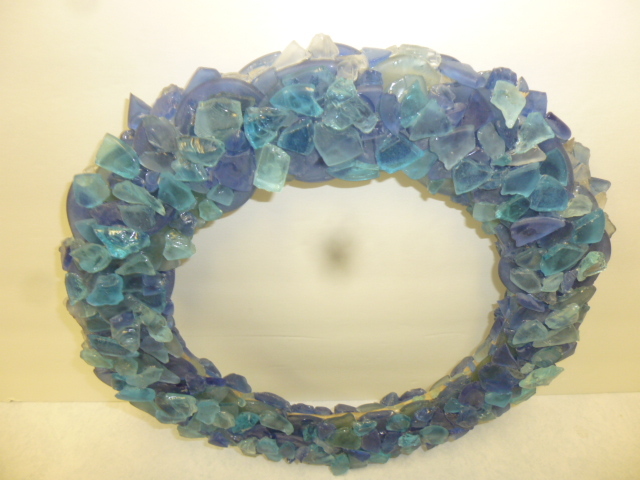 I only had enough blue glass to make one wreath. 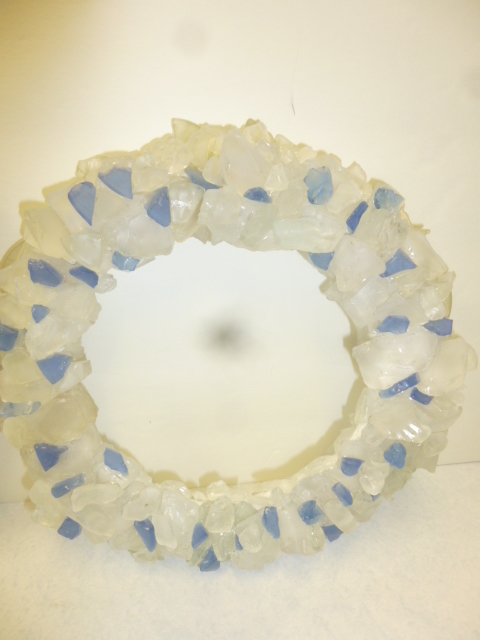 Dark blue frosted glass, and clear and frosted aqua. 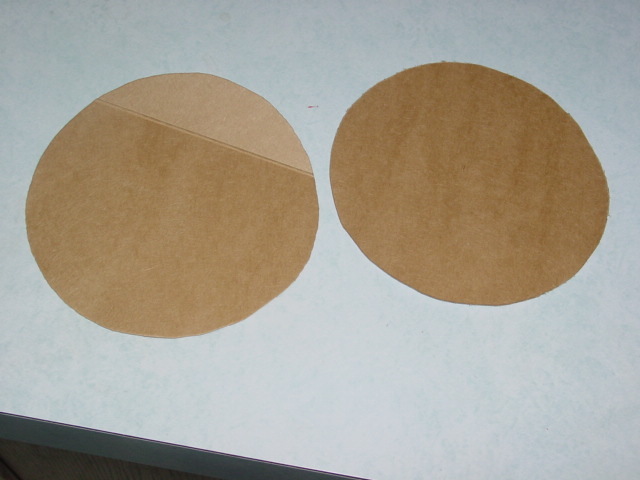 I even ran out of tiny pieces to fill in the inner edges; where you can see a bit of the tan cardboard between the front and back layers. I SHOULD have used blue paper! Had to improvise on the backside and fill in with white. Like I said though, you don’t SEE the back once it’s hung. Just a little bit of the side edges if yo are looking from a side view. Making them is kind of like doing a jig saw puzzle. You just have to play around with different pieces until you find one that fits the spot! Backside. 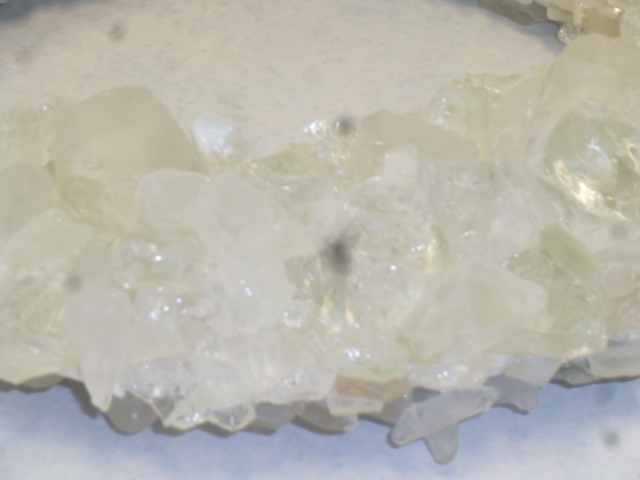 Several of these clear glass pieces were HUGE. 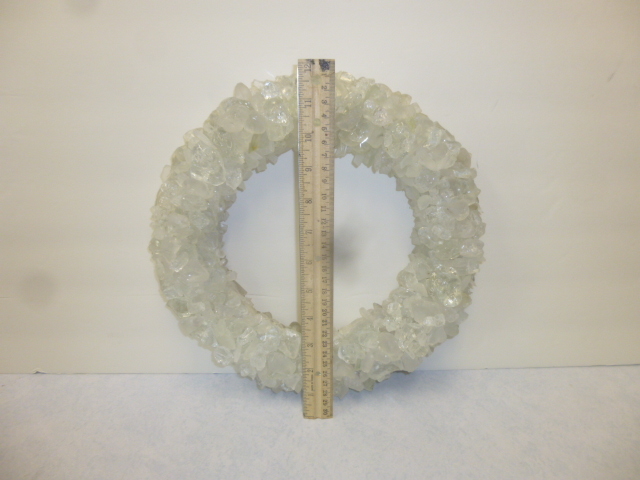 Too huge to use on the wreath. I tried breaking them with a hammer and they wouldn’t budge! Guess I’ll be donating the leftover big green pieces. This one ended up very deep too. Don’t ask me WHY I bought the dark brown glass?!?!? But I had it so I decided to use it, and then embellished with some small tan frosted pieces. A lot of the brown pieces were too big to use also. 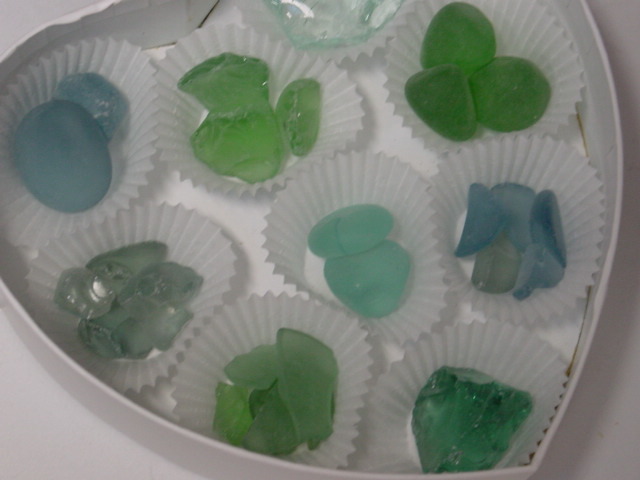 And that is how you use up two big drawers full of sea glass! Haven’t yet decided where to put these yet. 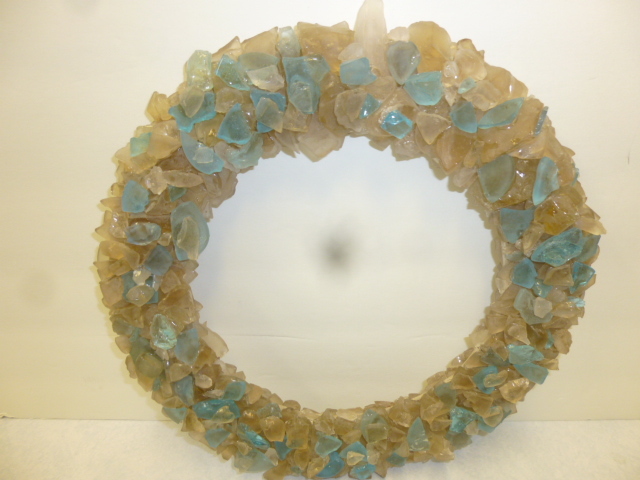 I have 4 or 5 smaller ones at Stars already, and etsy has HUNDREDS of sea glass wreaths already listed. Where the heck have I been?!?!?! No, I haven’t keeled over or been sucked into a sinkhole or even been sick. I’ve been right here . . limping along STILL! sigh. The physical therapy for plantar fasciitis WAS starting help considerably, then last week I woke up and the outside edge of my foot started hurting. (just after PT had me start exercising my foot with the stretchy bands) After my next PT appt my ankle started swelling and the pain continued to worsen. My arch and heel (the original sources of pain) feel much better, but the ankle and outside edge of my foot are getting much worse. So, I’ve really been trying to just stay OFF my feet as much as possible, and working on projects that I can do sitting down. 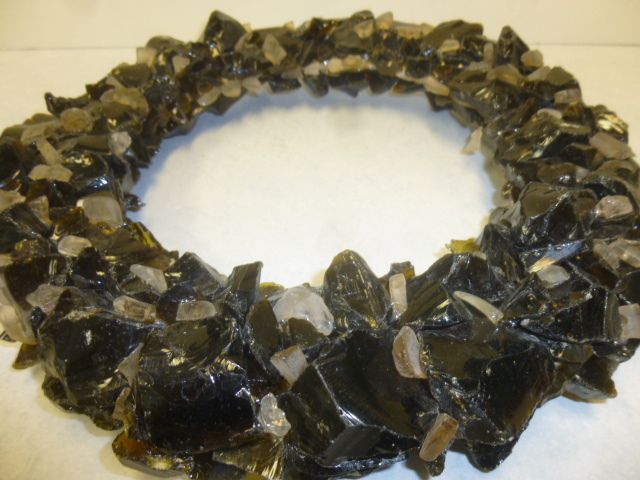 Stuff like Christmas wreaths (seriously!!) 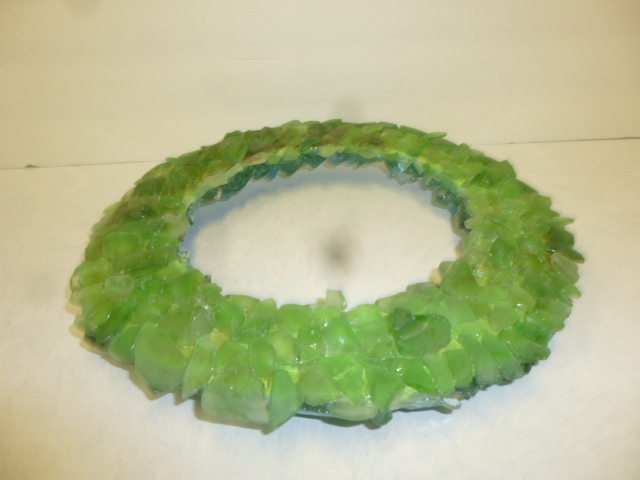 I found a BUNCH of grapevine wreaths and needed to ‘use them or donate them’. 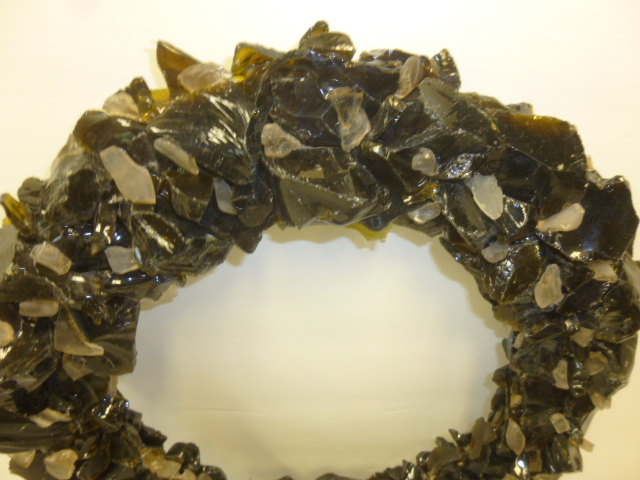 So I called the show owner and asked if I could do some wreath for the fall show. 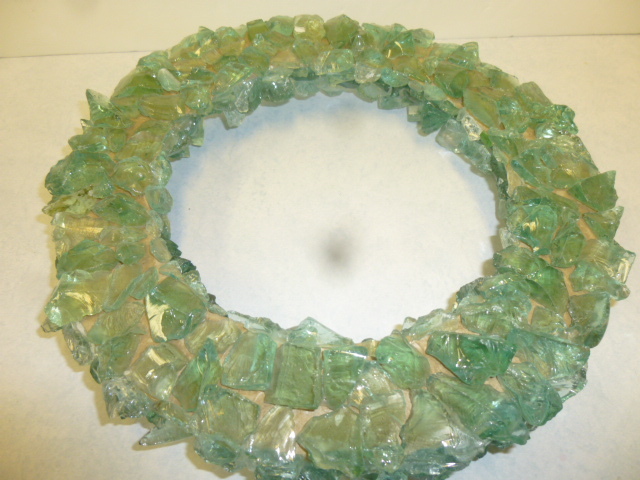 Spent another entire week making a bunch of sea glass wreaths. Not doing a lot of sorting through boxes until my foot pain gets better. The pain really wears me out too! Been taking loooooooooong naps every day. Just not doing much of anything that is ‘blog-worthy’! I was supposed to go to my last PT appt tomorrow, but they called to reschedule. My follow up appt with the podiatrist is on Monday, so I’ll wait until after that to see if I need more PT. 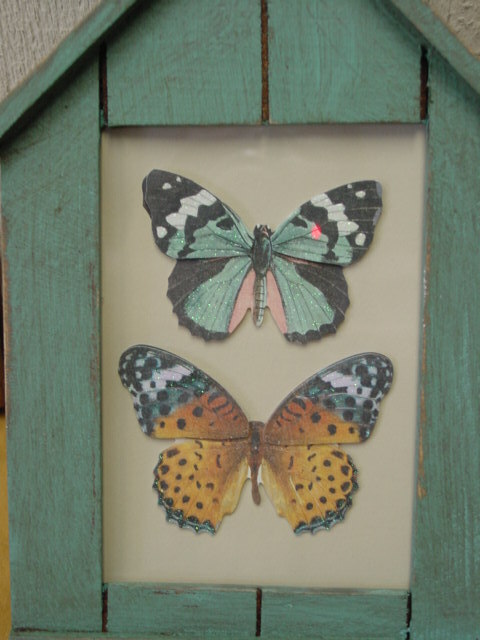 My etsy shop news. What’s NEW and what’s changed. 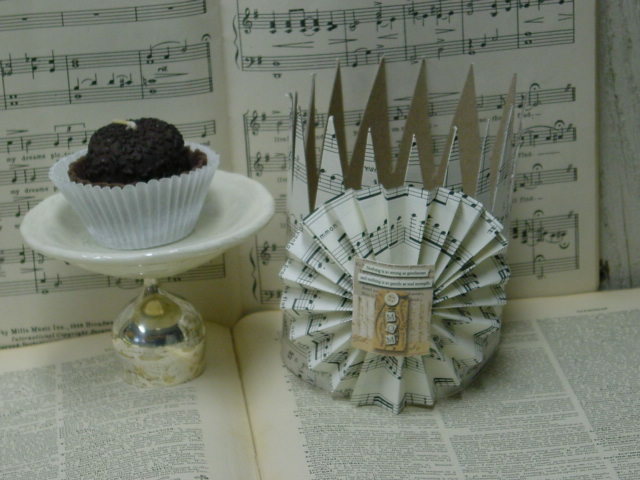 Sweet little cupcake stands WITH yummy chocolate truffle candle! Crown not included. 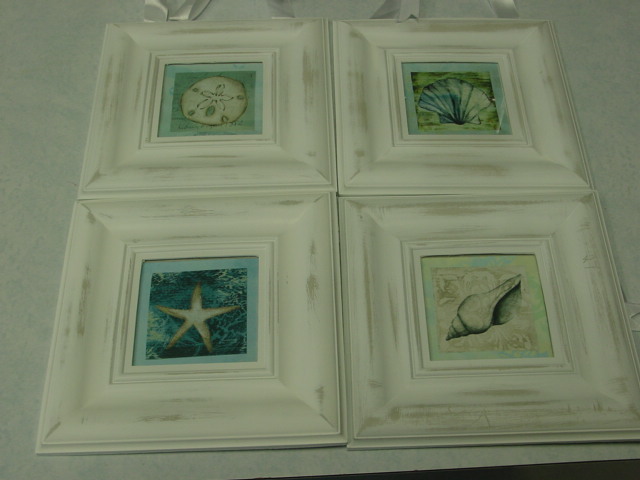 Set of four shabby beach cottage plaques. 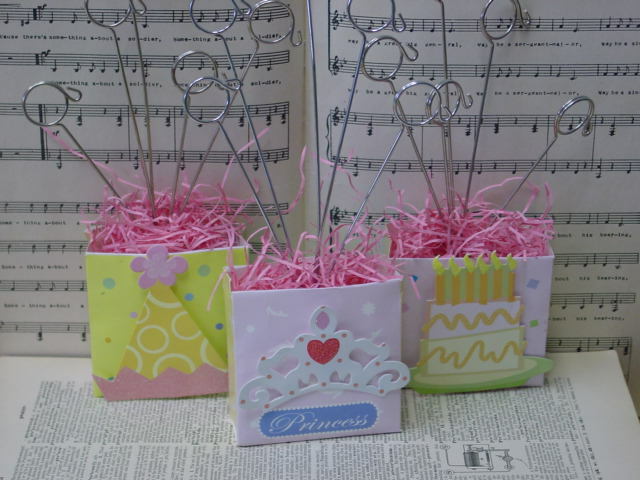 Princess party theme photo holders. Frozen Charlotte mini plaques set. 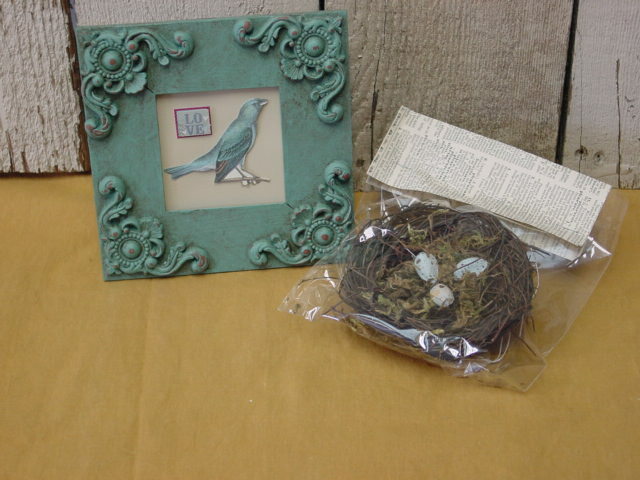 Framed bird collage and little nest. Shabby lantern shellscape. 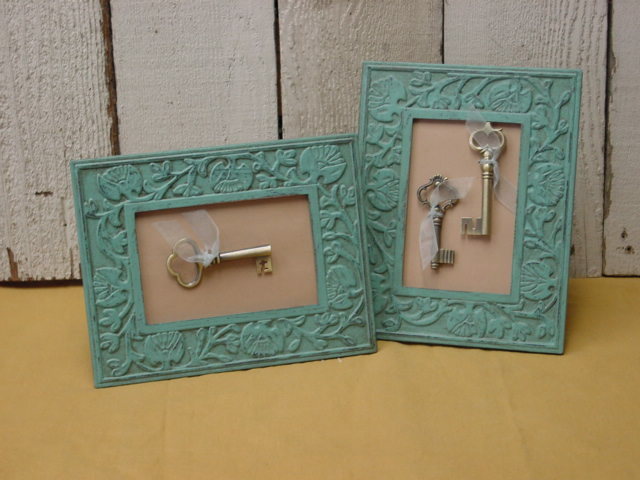 Beach wedding decor? 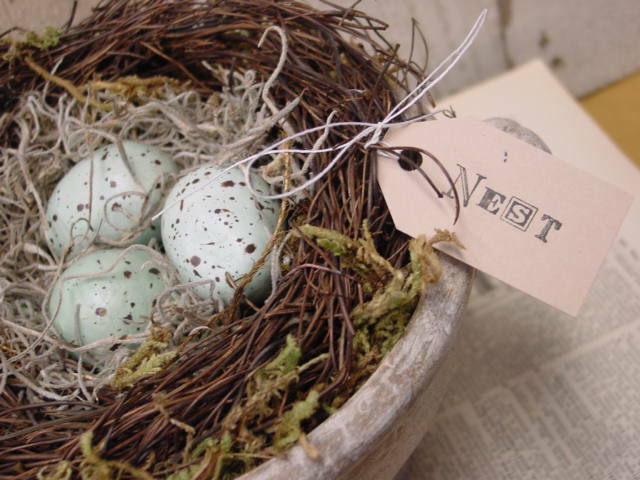 Nest and eggs in a vintage shabby urn. Bundle of four shabby old books to decorate with. As for what’s CHANGED: After much thought, aggravation and consideration, I have decided to no longer offer custom signs in my etsy shop. More often than not, it ended up that I’d spend the better part of a day conversing with a potential purchaser, hashing out all the details; only to have them NOT follow through with the purchase. With the ‘bad’ inquiries FAR outnumbering the ‘good’ ones, I just decided that my time would be better spent CREATING and LISTING product; than spinning my wheels and going nowhere with custom inquiries. 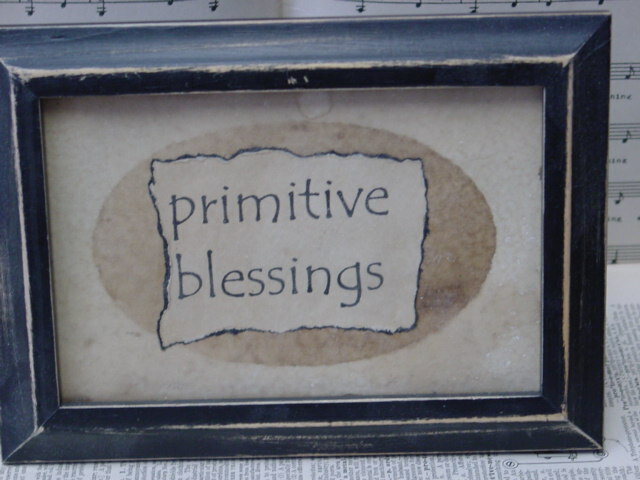 BUT, that doesn’t mean I won’t DO custom sign orders anymore!! 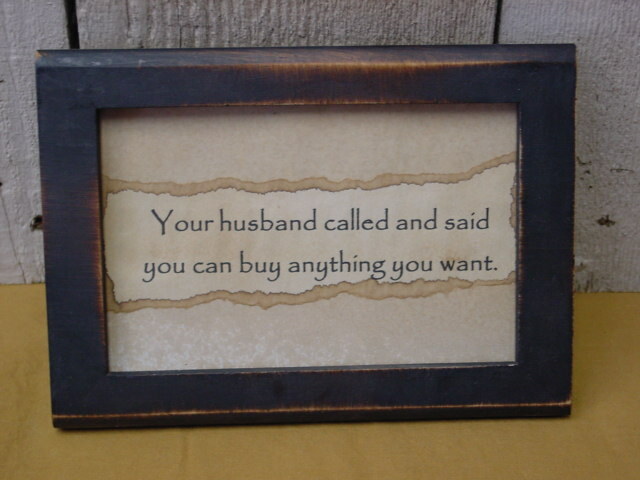 I just no longer want to ‘put myself out there’ as a custom sign maker to the WHOLE ETSY WORLD anymore. I hope that makes sense to you all, and doesn’t offend anyone. I just need to be sure I am BEST UTILIZING my time and energies. 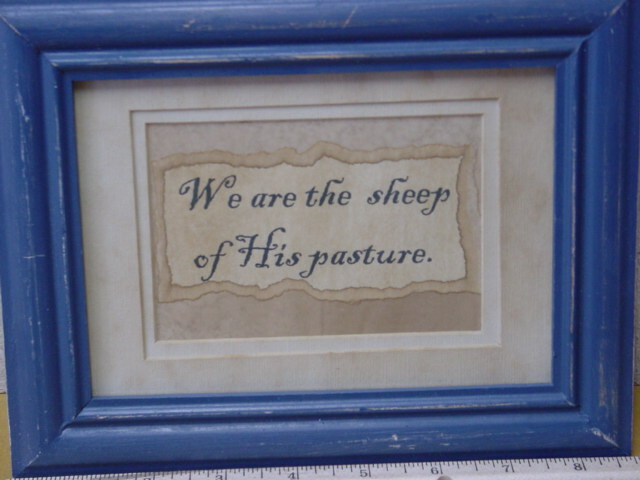 Feel free to email me with your custom sign request, and I will get back to you with a price quote. 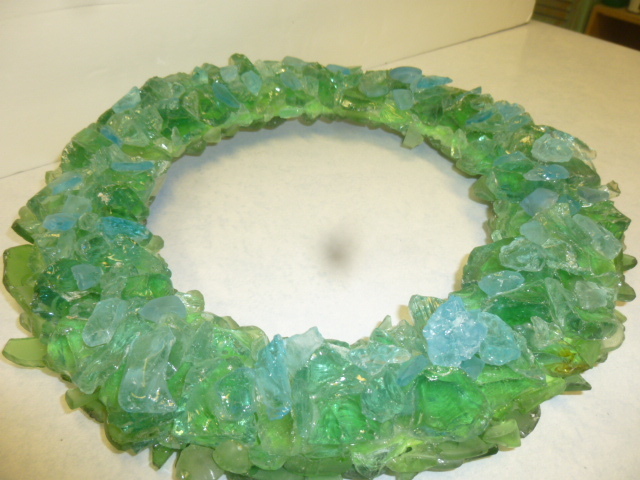 I saw a sea glass wreath on another blog (of course I can’t remember WHICH blog!) 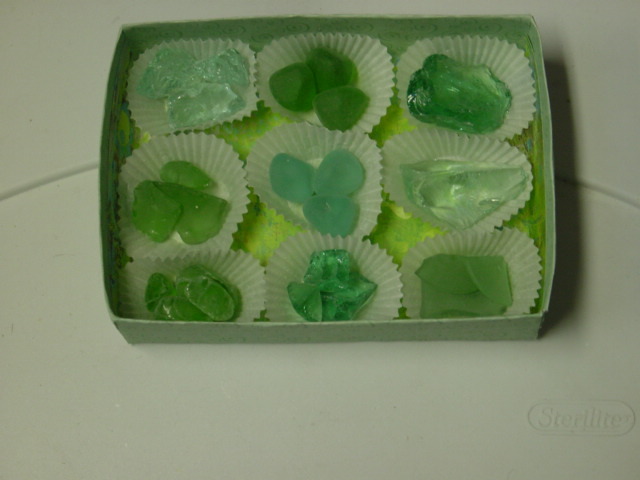 about the same time I was working on my little boxes of sea glass, and decided to try my hand a one. Is it just me, or is something missing? Since I can’t remember WHERE I saw the one that inspired me, I can’t go back and compare. But it didn’t have any other ‘components’ to it. Maybe this one just looks off because it’s hanging on an aqua background!?!? I dunno! So, I tried one in a different color. STILL feels too plain! They’re not very big. 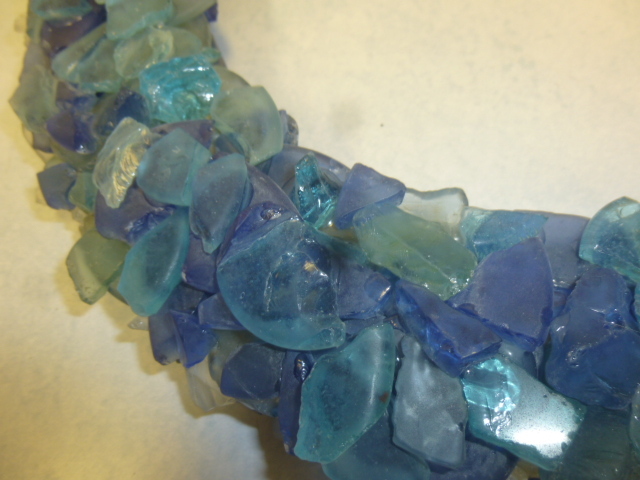 The sea glass is heavy, so you really can’t go too big. 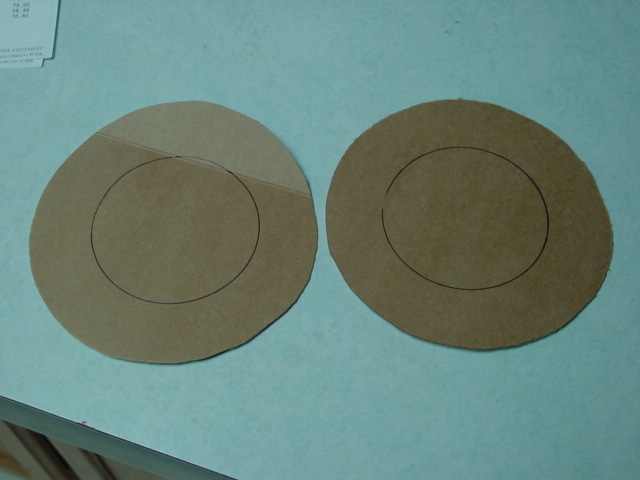 I used a small dessert plate to draw my circles on cardboard. Cut out TWO to make it nice and sturdy. 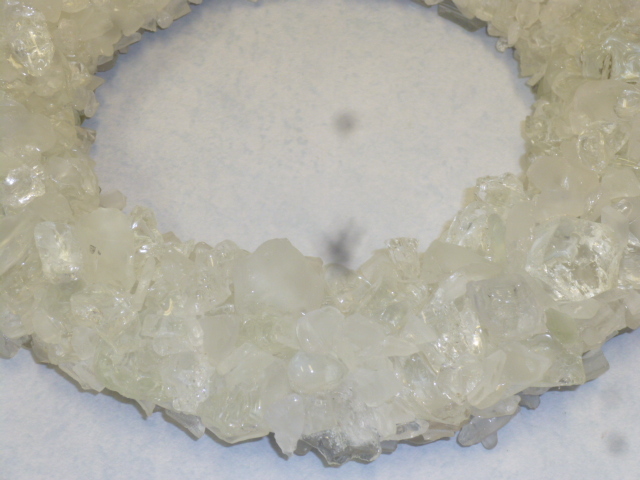 Used a small bowl to draw the inner circle. Cut a slit to get to the inner part to cut it out. 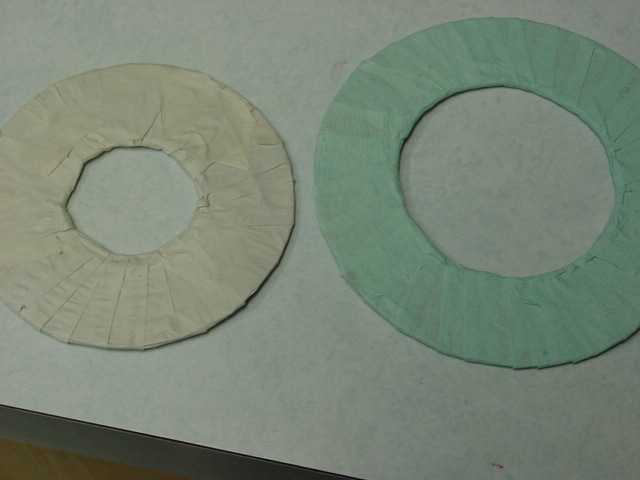 When I glued them together I just made sure the two slits were in opposite sides of the form. 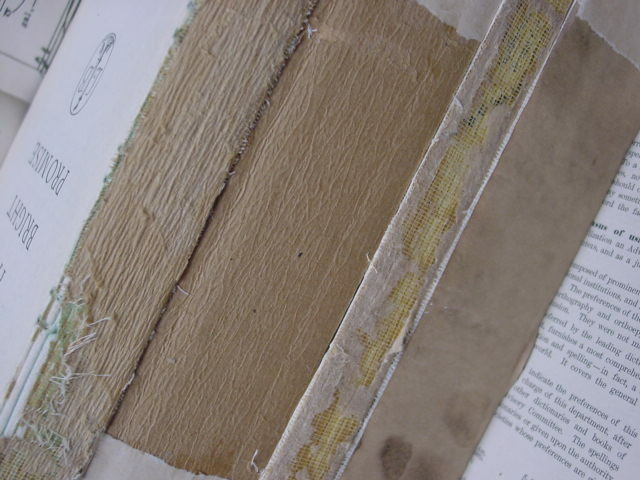 Glued on strips of paper to cover the form, which added strength. 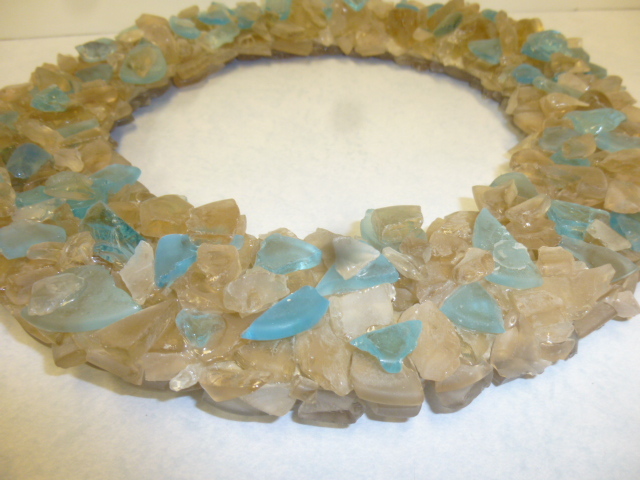 Let this dry overnight before adding the sea glass. 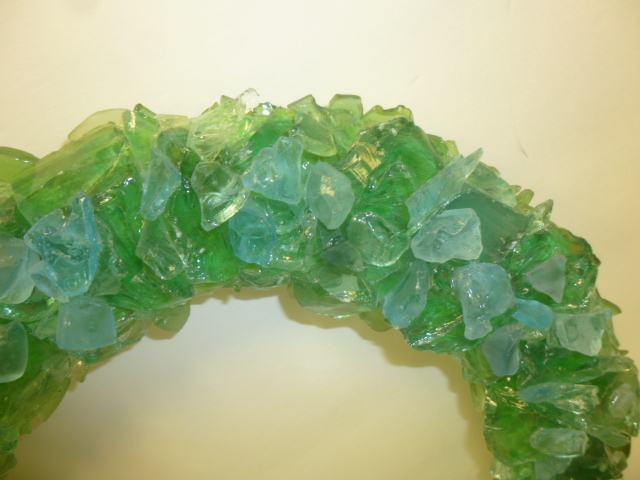 I just used regular tacky glue for the paper, and to glue my sea glass on. OH!!! I did some searching and FOUND the blog that inspired me. WHY do I like that one BETTER than mine??? Is it just because that one has the glass ‘going over the edges of the form’ more? Is it just that that one is shown in more creative settings? What’s the difference???? I’m really NOT liking mine as well. pooh!! 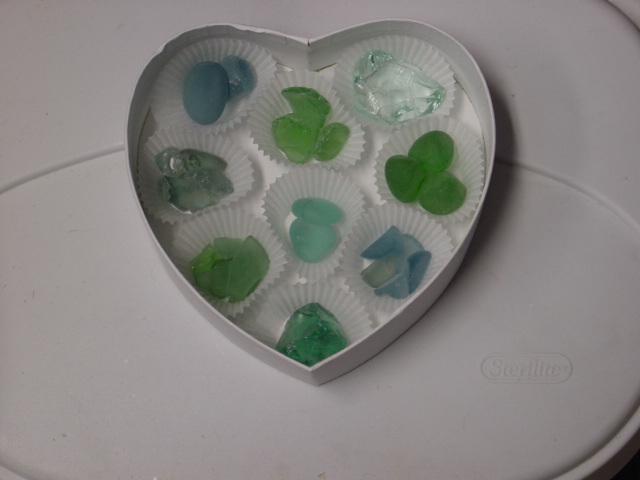 As I was rummaging through by bin of shells to find the perfect ones to fill another little box with, I came across some bags of sea glass. LIGHTBULB!! Wouldn’t THESE look pretty in the fluted paper cups too?!?! 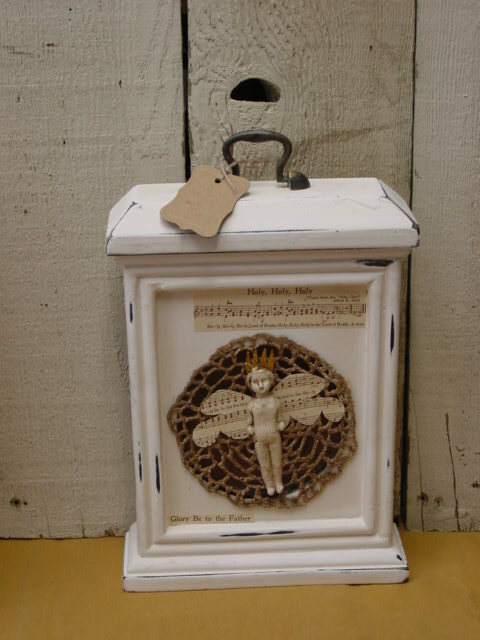 I may have to go back and add some ‘fringe’ along the edges of the heart shaped box. The ‘treasures from the sea’ tags are ones I just printed up on my computer. I just did an entire page of them, different sizes and different fonts, and tore them into strips. Just look at all those yummy colors! 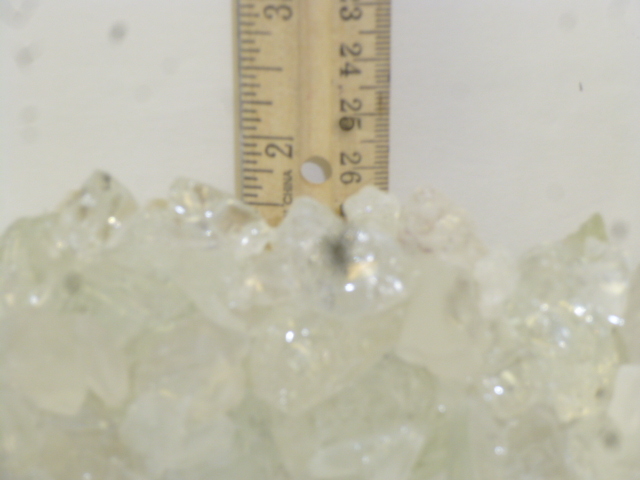 Some of them are almost a perfect ‘gumdrop’ shape! I didn’t think I was going to be able to find enough different colors to do all the compartments in this box, but between the clear and frosted glass, I had just enough. It was kind of fun digging through the box to find ‘ just the right ones’. Debating whether or not I should GLUE the glass into place before I take them to our booths to sell. 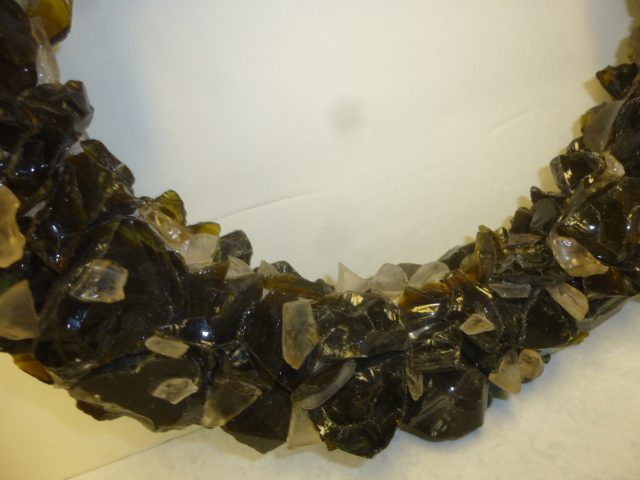 I kind of DON’T want to, because I enjoy picking up and holding each piece, and I’m sure potential purchasers would too. It’s the ‘hold in your hand and slip it into your pocket’ shoppers that I am worried about! 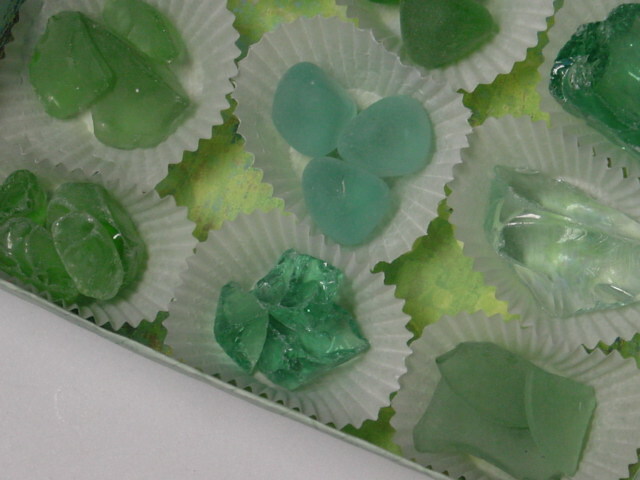 Don’t those turquoise ones look just like gumdrops??? 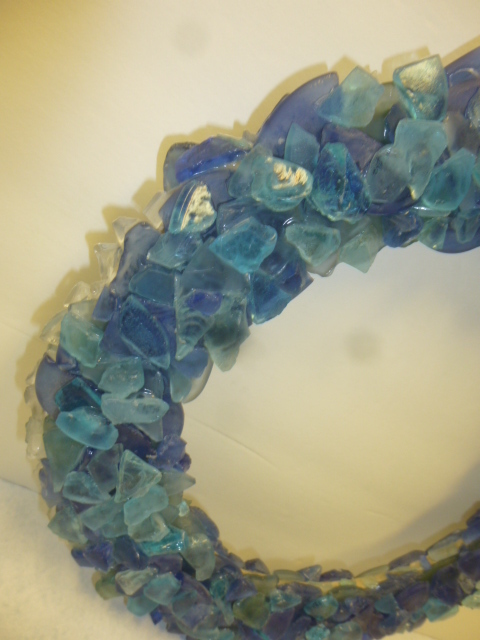 Working on some jars filled with the sea glass too.